So I have this friend. She is what you might say slightly obsessive compulsive when it comes to germs. She washes her hands constantly. We always tease her about her crazy habits and the fact that she uses Aveeno overnight intensive hand cream multiple times throughout the day. If she were using a soap from Lippincott Soap Co. when she felt the need to lather up I’m sure she would be moisturizing a heck of a lot less! Not only are these soaps ultra moisturizing, but they come in the most intoxicating scents you have ever laid your nose on. Birch Bark takes you straight into a fall forest where you can literally smell the air as it brushes past the tree bark. And Orange Clove fills you with a spicy and warming citrus feeling inside. There is nothing quite like the relaxation of a nice hot shower, and aroma therapy is so much of that “Ahhhhhh” feeling. 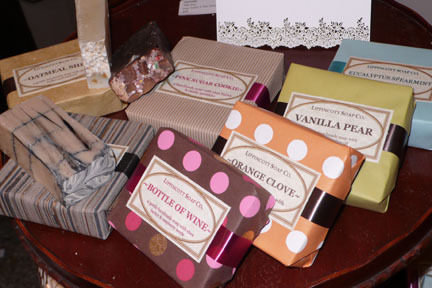 As if these soaps could get any better, they are frighteningly delicious looking. Pink Sugar Cookie could be a first cousin to the brownie, and chocolate amber looks like straight up fudge. They are hand made in PA! Ditch the Irish Spring. Lather up!